Be the first to share your favorite memory, photo or story of Horace. This memorial page is dedicated for family, friends and future generations to celebrate the life of their loved one. Mr. Horace Sterling Lewis, age 88, of Aragon, GA passed away Sunday, November 25, 2018. He was born in Aragon, GA on July 26, 1930, a son of the late David Martin Lewis and the late Lizzie Barnett Lewis. Mr. Lewis lived the greater part of his life in Cobb County moving back to Polk County in 1989. 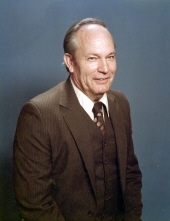 He was of the Baptist faith, a Veteran of the United States Army and retired from Mead Paper Company in 1995 after 40 years of service. In addition to his parents he was preceded in death by five sisters: Irene Acrey, Frances Akins, Kathleen Boatner, Bertha Mae Thompson and Reba Childers; and by four brothers: J.D. Lewis, C.W. Lewis, Hugh Lewis and Billy Lewis. Survivors include his wife of 65 years, Mrs. Doris Akins Lewis of Aragon; daughter, Eva Charlene Lewis, Dallas; two sons: David Lewis and his wife Kathy, Dahlonega and Gary Lewis and his wife DeAnn, Aragon; seven grandchildren; eight great grandchildren; and a number of nieces and nephews also survive. Funeral services will be held Tuesday, November 27, 2018 at 12 noon in the chapel of the Alvis Miller & Son Funeral Home with Dan Thompson officiating. Interment will follow in the Aragon Cemetery. Pallbearers will include: Jonathan Lewis, Evan Cochran, Edward Akins, Reggie Brumbelow, Dean Lewis and Steve Lewis. The family will receive friends Tuesday from 10:00 am until the funeral hour at the funeral home. The Alvis Miller & Son Funeral Home is in charge of arrangements for the funeral of Mr. Horace Sterling Lewis. To send flowers or a remembrance gift to the family of Horace Sterling Lewis, please visit our Tribute Store. "Email Address" would like to share the life celebration of Horace Sterling Lewis. Click on the "link" to go to share a favorite memory or leave a condolence message for the family.